Racer Jason was kind enough to take me for a quick flight in his Vans RV-8 after the SARL race at Taylor last Saturday. What had been a very dull, overcast, gusty kind of a day turned into a broken cloud evening, with calmer winds. The sun played golden light over the tops of the clouds, and we wended our way through the holes; up into the hills and valleys of ghostly fabric hidden from the ground. My eager craft through footless halls of air. . . .
On Friday 18th November 2011, I got to fly the North American T-28 Trojan! No sooner had they shut down, than Joe jumped out and beckoned me over. We made our introductions, and he began to show me his aircraft. This particular aircraft is a T-28B model, flown by the Marines. Built during the 1950s, these aircraft were used as primary training aircraft by the US Air Force, Marines and Navy. The original A models had 800hp engines and were replaced by the B model, which has a 1425hp 9-cylinder Wright Cyclone engine. Top speed is over 340 mph. The Navy chose C models which had shorter prop blades for better ground clearance, and tailhooks for carrier use, although they were not as fast. The B model is the rocketship of them all. The T-28 is a really tall aircraft, over 12 feet high. Standing next to it, there is a wall of fuselage reaching above you. It has massive ramp presence. Getting in requires some climbing. The flap hangs down at a steep angle. It contains two foot holes with sprung covers that push back when you put your foot in there. A hand hold on the wing allows for some purchase, from which you can haul yourself up onto the walking surface at the wing root. Once up there, Joe showed me how to get into the cockpit. There is another step set into the fuselage wall. Put one foot in there, grab both sides of the canopy edges and step over onto the seat. Drop down into the surprisingly roomy cockpit. He had me sit in there for a few minutes while I signed the inevitable waiver (three pages of close-typed legalese) before climbing out again in a reverse sequence. Now I was to put on the parachute. Chip gave me a hand putting on the harness - much like putting on a jacket - before the webbing straps are pulled through from underneath and crossed over in front. It ends up nice and snug. It's not going anywhere (which is a good thing!) although it feels odd having your centre of gravity moved further back, with the weight of the parachute under your bum. Although it would most certainly be welcome if anything went wrong, its main duty is as seat padding. Climbing back into my seat, it was time for a safety briefing. The T-28 has a hydraulic canopy. If we lose hydraulics and have to get out, there is a yellow handle to the left of the seat, which discharges a compressed air bottle to blow the canopy back. This is for emergencies only, naturally. Normal exit procedure is for the pilot to command the canopy to roll back, then we would stand on the seat, grab the parachute ripcord handle with the right hand, and dive out to aim for the wing. You're not going to hit the wing, but you want to avoid hitting the tail. After that, pull the rip cord and hopefully float back to Earth. I was soon strapped into my seat. The strap harness has a locking mechanism, controlled with a small black handle to my left. For takeoff and landing, this must be locked down, which holds you fast in your seat. In level flight this can be unlocked, which allows you to lean forward and move more freely. While Chip had been dealing with me, Joe had been doing his walk-round checks, and now we were going to fly! Joe settled himself in his seat up front and made his cockpit checks. Then he started the engine. This is always a momentous event in a T-28, when the relative peace of the airfield is shattered by the whine-cough-clatter of that big Wright motor beginning to turn the shiny three-blade prop. Smoke billows from the exhaust as avgas is converted into colossal amounts of noise, then the smoke clears as the engine spins faster. We sit for a while as the engine warms up. Joe closes the canopy to allow me to mount my cameras. He gives me warning to stay clear, then both halves slide forward smoothly on the rails. He would normally do this later on, as it can get very warm inside, but it's actually a pretty cold day for Central Texas so we're OK. I plug two cameras onto the canopy with sucker mounts and set them going. We start to taxi from the ramp towards the runway, but only for a short distance. Joe stops us at a taxiway intersection for power checks and run-up. This takes a little while, longer than for smaller aircraft; I guess there's a lot of engine to manage, and oil to get warm. After a few minutes of this, he turns us around and we continue towards the runway. We hold short for a moment to check for traffic, then take the runway. Joe holds us on the brakes while he increases power, then he lets go and we surge forward. The T-28 gains speed quickly and we are soon airborne. It climbs quickly too; we are whisked up into the sky in very short order. You can see here that I am enjoying this. However we don't gain much altitude before Joe dives for the race start line at Macho Grande, which is very close to Taylor. He wants to make a practice start for the race tomorrow. We come swooping in and zoom down the runway there, before climbing back up seemingly effortlessly, but only up to 2500 feet. We can't go much higher due to the cloud base; it's not the most aviation-friendly weather but that's the luck of the draw. He swung us around that turn and we headed back south. We found the lake and flew around it so that Joe could recognize the local area during the race. Then, to my very great surprise, he asked if I wanted to fly the T-28! I was certainly not expecting to be able to take control of this aircraft, so I was delighted. Taking the stick, I began to get a feel for the plane. I found it easier to maintain my altitude in the T-28 than in other aircraft. Perhaps being so heavy on the controls, I am not making enough movement in this aircraft to affect it so much. Or maybe the large mass and momentum just take longer to overcome. Either way, I was happy about this, and was able to make some fairly level turns. Last week's lesson from the PT-22 about rudder pedals helped too; the ball stayed mostly centered during the turns. See, Joe's hands are up on top of the panel - this is my airplane! Joe suggested I make some steeper turns, so I banked it over to 45-50 degrees and we went around in some tighter circles which was fun. The aircraft feels very planted the whole time; even with the gusty winds it did not twitch around the sky. We skirted Taylor airfield to the south; I made sure to give it a wide berth with all the other racers flying in and out for their own practice. Joe had me make a gentle descent down to the 1600 foot circuit height, and we made a turn towards the airfield. Joe took back the aircraft and slotted us into the pattern. We slowed down and rounded the corner from downwind to base to final, approaching the runway at around 100 knots. We touched down with a slight crosswind, the aircraft landing in its solid fashion. Rollout, then taxi back to the ramp. Joe ran the engine for a short while; it seems to be standard practice to run it at a reasonable speed for a few minutes before shutdown. Eventually he cut the engine and the prop wound down to a stop. Magnetos off, and the whine faded to leave that relative peace and quiet once more. 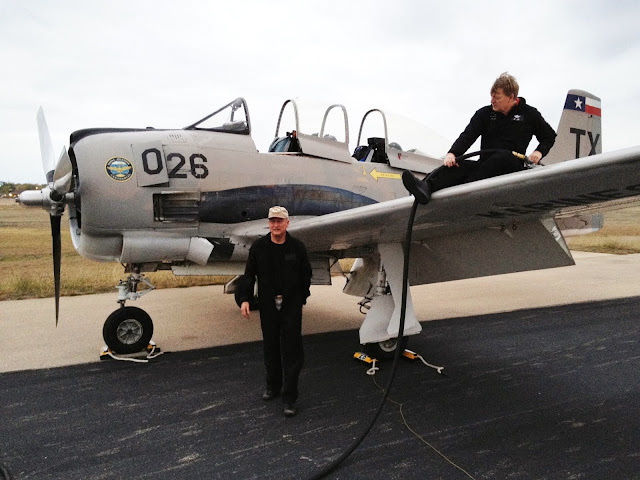 Here's Joe (standing) and Chip (on the wing) fueling the aircraft after the flight. It drinks a lot of fuel. Don't even ask! I am very grateful to Joe and Chip for such a fabulous experience. What a way to fly! This weekend I was very lucky in the flying department. Two rides on consecutive days! The story starts with a B-17 visiting Georgetown airport. In particular, 'Aluminum Overcast', the one owned by the EAA, that tours around the country. She was stopping here in Central Texas so I figured that it being Veterans Day, it might be appropriate for me to go and visit. Off I trotted, and there she was, in all her rumbly glory. I got some shots of her on the ramp and on takeoff; all very nice. We jumped into his aeroplane and rigged a couple of cameras. Glenn has a GoPro mount on the wing strut, so we plugged my GoPro into that, and I stuck the Contour onto the side window. We took off and headed out over Georgetown Lake, which like all the lakes in the area, is pretty darned low right now. At least it still appears to have usable boat ramps, unlike Lake Travis. However I don't think you're meant to be able to see all these islands. We continued on towards Kittie Hill which is not far away. It's a small grass strip just alongside Hwy 183. I attended a fly-in here a couple of years ago which was a lot of fun. Today, we come in low, right above the trees. Glenn made a nice landing despite the gusty wind and rough runway. The poor grass is a casualty of the brutal hot summer, along with everything else. Thank you Glenn, for a very fun outing! Next day, I headed south to Kingsbury Aerodrome, for their annual Fall Fly-in. This is always a lot of fun; the Pioneer Flight Museum has a bunch of WW1 vintage aircraft and vehicles which are rolled out for the day. There's usually a good number of visitors too, and today was no exception, even if the numbers were kept a little low by a gusty wind, at times across the runway. One of the volunteers, Dave, helped to hand-prop the engine so we could get under way. This Ryan has the 160 horsepower 5-cylinder Kinner Radial engine, which was very popular in the 1930s. The same engine powers the Museum's Meyers OTW aircraft. It makes a wonderful tickety-putt noise that modern engines just don't do. We taxied down to the runway, lined up, and Steve added power for takeoff. The Ryan rolled forward and was soon in the air; the engine singing 'puckety-puckety' as we lifted off. We made a circuit of the airfield and came back in for a low flyby, for the watching crowd. In the shot below, you can see some photographers standing by the windsock; the main fly-in is located further back. We climbed out of the airfield and headed north. Steve then really surprised me by asking if I'd like to fly it! The day gets better and better :-) So I took the stick and set about enjoying a rare opportunity, to fly a WW2 trainer. I checked for traffic, and then made some very gentle exploratory turns, right and left. The aircraft seemed nicely responsive and fairly light on the controls. I flew along straight and level for a little bit, and then tried a steeper turn to the right. The aircraft started to teach me about the rudder pedals. We were flying at about 1000ft and Steve suggested we go a bit higher, so I started a gentle climb and shortly afterwards leveled off at 2000ft. By this time, we had wandered off a fair way from the airfield. I figured we had better go back, but first I had to figure out where it was. Kingsbury is hard to spot from the air, it looks a lot like all the farmland surrounding it, and even a ramp full of visiting aircraft blends in from a distance. Looking around, I realized the major giveaway of the I-10 interstate was a ways off ahead of me, and there is also a large pig farm close to the airfield. Once I spotted that, all was well, and I could turn towards the airfield. However my altitude hold was suffering while I was looking around; this is something I really need to work on. We had descended to about 1800ft. I just held it there for a while. The wind was also occupying my attention. It was very gusty and blowy. Sometimes it felt like Steve had pushed the stick; the wind just shoved us around. This taught me more about the rudder pedals! You really do need to use them to hold your nose on course. I guess this makes a good training aircraft; you really have to fly it. I certainly learnt more about the rudder in those 20 minutes than in any other aircraft before this one. Here's me in front with the dork-cam on my head, and Steve in the back. Camera mounting options are a bit limited in an open-cockpit environment! However, it is a fabulous way to fly. It's so immediate, with the wind rushing past, and the smell of the air. Thank you Steve, for a wonderful experience. Videos will be forthcoming from both of these flights... it takes me a while to edit them, so watch this space; could be a couple of weeks. A few posts ago, I spoke about the big fire at Bastrop, and showed some images of the damage. I also took video footage as we flew around. Here's the finished film showing out flight from San Marcos to Georgetown, spending some time orbiting the fire scar on the way. The Sport Air Racing League held a race in Cleveland, TX on the 15th October. This airport is north east of Houston, about an hour's flight directly east of Taylor. Mike and I launched out of Taylor just before dawn and watched the sun rise. We arrived amongst a cloud of other racers in the circuit, all landing in plenty of time for the race briefing.